The B16 backplane provides the basis to create a Distributed MPPT (DMPPT) system for thermoelectric generators. 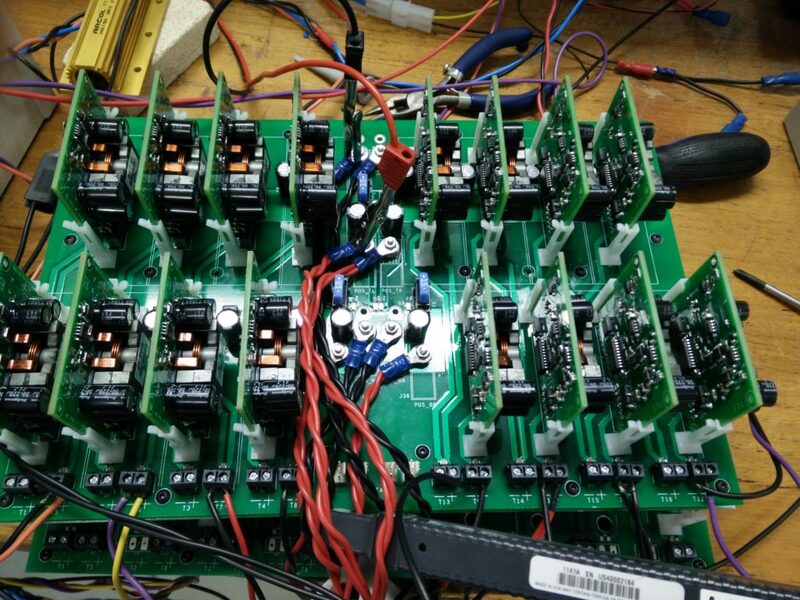 The B16 backplane interfaces up to 16 KM3 converters (each connected to different TEGs), connected in parallel to the same 12V battery. 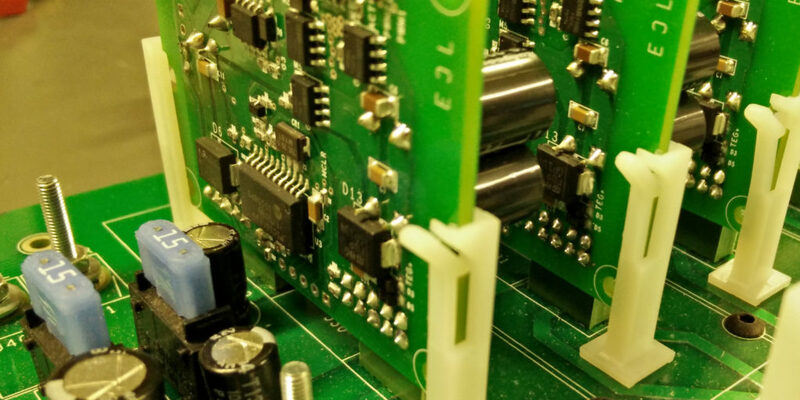 Each KM3 converter is slotted through the vertical PCB guides that also lock it in place with notch clips. This mechanical assembly withstands strong vibrations and allows use in tough mechanical environments. Electrical connection of the KM3 converters to the backplane is provided through two 5 x 2 pin sockets. The KM3 converters are organised in four banks. Each bank has four KM3 converters and two M3 bolt connections for the battery cables. The four battery connectors are not connected together on the board. This means that each bank can be connected independently to a battery. To common up banks of converters together (for example if only one battery is used), all “+” cables must be connected together to the battery’s positive terminal and all “-“ cables to the battery’s negative terminal. Similar procedure must be followed to use two batteries (with two banks each). Each converters bank has a quick-blow mini-blade fuse holder (normally fitted with 15 A fuse). When a battery is connected to any of the four banks its related green LED turns on. The TEGs are connected to the backplane using the screw terminals. Four 3-pin molex connectors (for 3-pin fans or auxiliaries) are connected to the battery. The B16 backplane is securely mounted on an Aluminium plate using M3 standoffs (contact us for different setups). The Aluminium back plate is not electrically connected to the board. 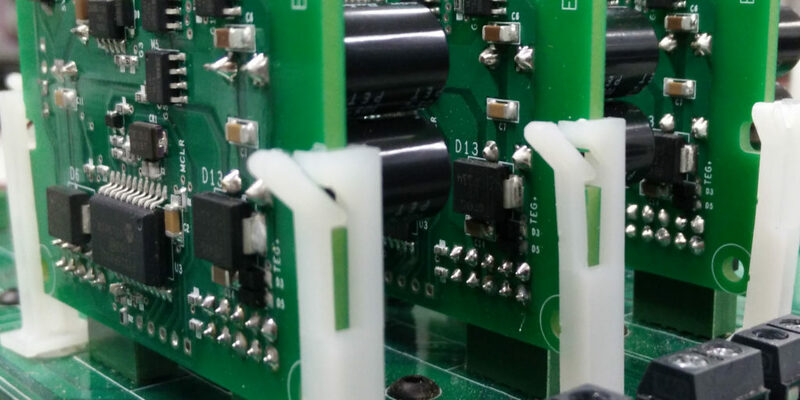 However, four M4 mounting holes, located and electrically connected next to each “-“ battery connector, are provided to connected the back plate to any (or all) of the battery negative terminals. It is suggested to connect the battery through a mechanical switch to prevent accidental short circuits during connection set-up.